Looking in the mirror after a beautiful tattoo. Healing magic. 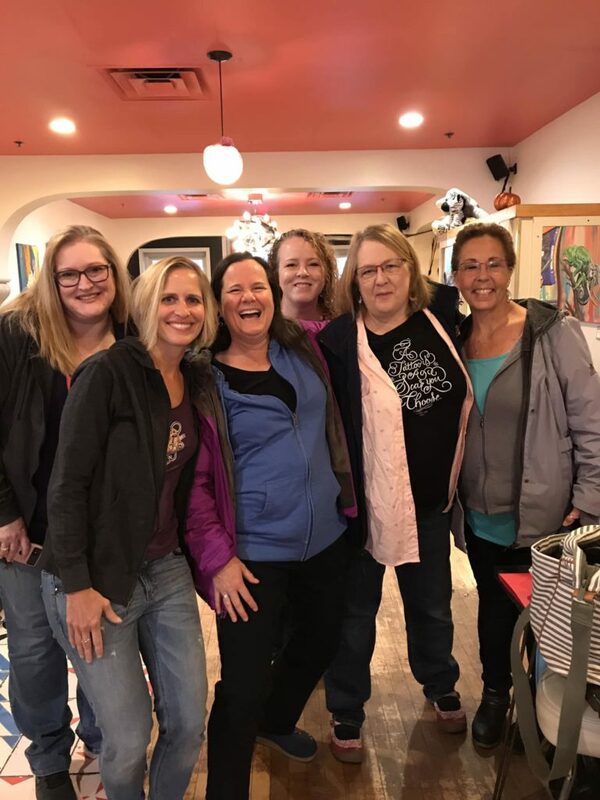 On Sunday, October 14, 2018, 14 women who all had mastectomies as part of their breast cancer treatments, got a complimentary tattoo over her scars as part of the Minneapolis – Saint Paul P.ink Tattoo Day. P.ink, pronounced pea ink, stands for Personal Ink. P.ink is an organization that is 100% volunteer run, and here in Minnesota, our local organizing committee is headed up by myself, Deb Kuhns and Michelle Banks. The three of us have all received a P.ink tattoo over our mastectomy scars, and all of us love this organization and what it has done for our appreciation of our bodies and all we have endured in the name of health and wellness. Mastectomies are not an easy surgery to undergo, after all, breasts are a powerful symbol of femaleness. For many of us, after undergoing a mastectomy, it becomes extremely difficult to look in the mirror. 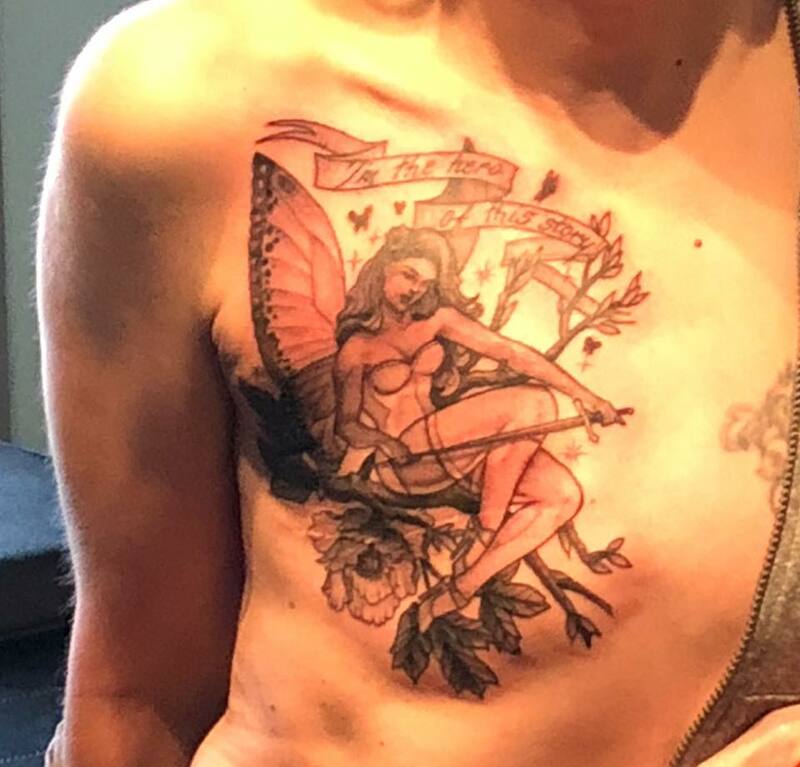 Getting a beautiful, meaningful piece of art tattooed over the scars is a powerful way to reclaim this loss. P.ink Tattoo Day, for almost every woman who participates, results in a positive re-connection to our bodies and to the mirror. Deb, Michelle and I, along with a small committee of dedicated volunteers, started organizing in April to get ready for the event on October 14th. We confirmed that we would hold our event at three tattoo shops: Twilight Tattoo, Evolution Tattoo and Tailorbird Tattoo. With our head artists: Shane Wallin, Emilie Robinson, Joe Andrews and Alli Shelly, we worked to confirm our 14 tattoo artists. I want to emphasize the incredible generosity of Shane, Joe and Alli and ALL of the 14 tattoo artists. Each artist donates their AMAZING artistic talent, and their time, and the ink to give these tattoos to the women who get selected each year. The value of each donation by each artist is well over $2,000. All to contribute to healing for women who have confronted breast cancer. Deb, Michelle and I along with the committee, worked to secure food donations for breakfast and lunch for all the survivor warriors, the tattoo artists and the family/friend support person that each survivor brought with her to the event. In addition, Missy Socha, who got her P.ink tattoo the first year we did the event in 2014, coordinated the gift bags & love notes we got each of the survivors. I am pleased to report that the day was a HUGE, beautiful success!!! All 14 women are incredibly pleased with her new body art. For your viewing pleasure, here are many of the tattoos. Again, GIGANTIC thank you to all the incredible tattoo artists for your artistry, skill and generosity! Here are the names of our amazing artists: Shane Wallin, Emilie Robinson, Matt Lawler, Matt Kolling, Erin Torola, Erin Matthews, Jamie Thomas, Jerome James, Wile Crotty, Joe Andrews, Helena Amor, Alli Shelly, Ariel Cafarelli and Lana Bosak. If you ever need or want a tattoo, all 14 of these artists are extremely talented! Plus they know how to tattoo over scars. Organizers meet at Glam Doll to kick off the day! Thank you all again from one of the P.Ink ladies 2017. I love the look I got. I’m so glad you got your P.ink Day Tattoo with us!!!! This makes me SO happy!!! What a beautiful gift! Thank you for all the work you and others do for this. And thank you for sharing. This was a most amazing experience for me and I am sooooo looking forward to digging into planning P.ink Day 2019!